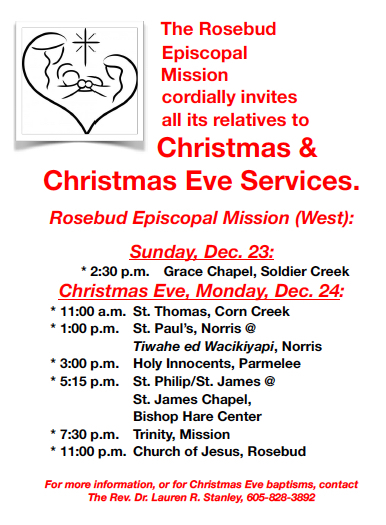 The Rosebud Episcopal Mission welcomes all of its relatives to its 11 Episcopal churches on t he Rosebud Indian Reservation in South Dakota. 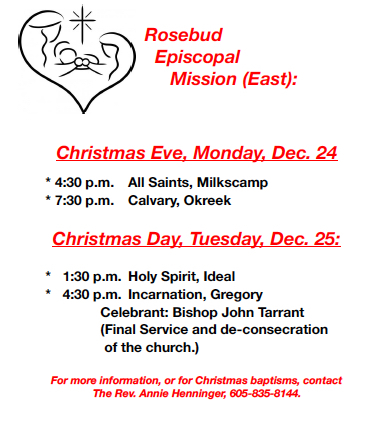 The Episcopal Church has served on the Rosebud since 1873, and serves all of the people here. •St. Philip/St. James, White River, worshipping at St. James Chapel on the Bishop Hare Center. We welcome all of our relatives – all of God’s beloved people – to our services. You may reach Mother Lauren at 605-828-3892. You may reach Mother Annie at 605-835-8144. We are offering services all over the Rosebud Reservation. Join us at one (or more)! As Lutheran pastor and theologian Dietrich Bonhoeffer sat imprisoned by the Nazis in Advent of 1943, he recounted a picture painted by the German artist Albrecht Altdorfer, in 1511, of the Holy Family. Many artists have painted a scene of the Nativity, but Altdorfer had captured the prisoner Bonhoeffer’s memory. Altdorfer painted the scene on wood panel. It is different than what we are usually accustomed to seeing. In Altdorfer’s painting, the sky is dark; full of clouds. The light of the star penetrates the sky casting a glow on the scene. The shepherds are at a distance in the background, easy to miss. The angels have a watchful eye over what appears to be a house or stable in ruins. The broken and crumbled brick walls look like the results of extreme neglect or maybe even war. In either case, it is the type of lodging in which a refugee family might find themselves. Just off center, in the foreground, you can see that part of this broken building is occupied by cattle. You have to look to notice Mary and Joseph behind a fallen wall. Joseph holds a candle in one hand protecting its flame from the evening breeze with his other hand. Mary is kneeling on the ground, looking adoringly at the child in front of her. All the while the angels look on. Bonhoeffer reflects that, perhaps Altdorfer meant to tell us “Christmas can, and should, be celebrated in this way too.” He concludes, “that, in any event, is what he does tell us.” and so from his prison cell, away from those he loved, in the midst of a world that seemed to be coming apart at the seams, Dietrich Bonhoeffer would celebrate Christmas. He would celebrate the best that he could, understanding what it was that he was celebrating, and what it was that was important. Bonhoeffer’s prison cell and Altdorfer’s painting remind us that God has come into the world that is. A world that has mass shootings,wars, house fires, and automobile accidents. A world where cancer still kills and children die of malnutrition and even a world with suicide. This is the world that God has entered, not a cleaned-up, white-washed world that makes for great pictures and pretty songs. God has entered into our world in the person of Jesus, just as it is, to guide and empower us to make it a bit more like the world God created it to be. At Christmas, we are reminded that God in Christ Jesus came and still comes to our world; the bright-lit homes and the broken homes; the happy hearted, and the lonely hearted; those who have faith and those who still seek. He comes and when we open ourselves to his presence he dwells among us. It’s Holy Week, and we have a lot to offer all of our relatives on the Rosebud Episcopal Mission. Join us for one of our many services! Hello. Our original plan was for me to tape a Christmas message in front of the United Nations building in New York as a way of sending a message that this Jesus of Nazareth whom we follow came to show us the way to a different world, a world rounded in God’s peace and God’s justice, God’s love and God’s compassion. I recently had surgery and so we had to change those plans and so I’m here in Raleigh on Capitol Square. Christ Church is here and we’re filming this message here just as a way of giving me a chance to say “Thank you” to all of you who sent cards and prayers in my recent surgery. I’m doing well and I’m coming back to work. But I did want to say something to you. It occurs to me that this Jesus of Nazareth really does make a difference. And God coming into the world in the person of Jesus matters profoundly for all of us regardless of our religious tradition. We who follow Jesus believe that the mountain came to us when God came among us in the person of Jesus to show us the way to live, to show us the way to love, to show us the way to transform this world from the nightmare it often is into the dream that God intends for us all. So, as the words were spoken on that night when Jesus was born, peace, good will to all people, God bless you, God keep you. A blessed Advent, a Merry Christmas, and a Happy New Year to all.